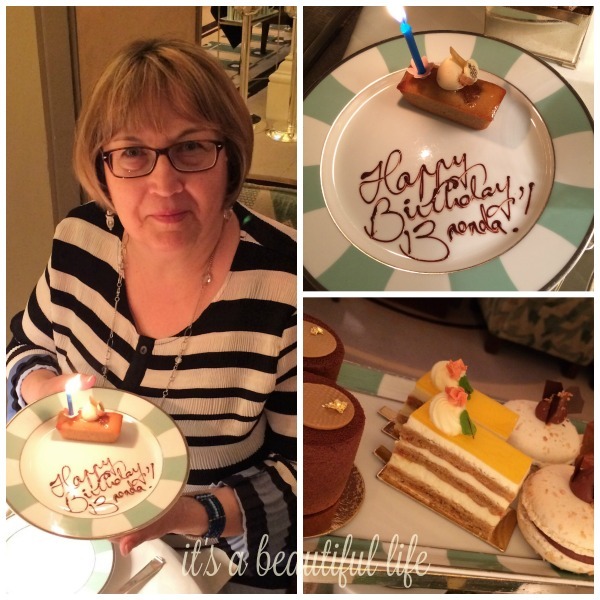 Brenda @ It's A Beautiful Life: Birthday Treats, Past and Present! Birthday Treats, Past and Present! This week's my birthday. Cards are arriving in the mail, I've been treated to lunch out, and had surprises in beribboned packages handed to me across the table. I feel like a child ... a little giddy even if I am turning 61. The feeling of being loved never gets old, does it? I just love how after twenty years of being married to my wonderful guy, Rick still knows how to surprise me with lovely treats for my birthday. This year he's taking me to see Mozart's opera Don Giovanni. We've only heard the opera music on the radio. Rick's never been to an opera and it's been years since I've been to one myself. So we are looking forward to this evening of operatic splendour and grandness. And who knows, this might spark a new interest for both of us to pursue in the future. For a wonderful rendition of the Overture (about six minutes), click here for the link. And, below is the 60-second trailer for the production we'll be seeing later tonight. "When I'm in London, Claridge's is a great place. It's now a year since that extra, extra special birthday treat from hubby last year. As you may recall, we took a little trip to Oxford to celebrate my 60th, posts here. We stayed several wonderful days at the Holywell Bed and Breakfast with our hospitable hosts and now friends Carrie, Stuart, and Jack, their most adorable doggie. 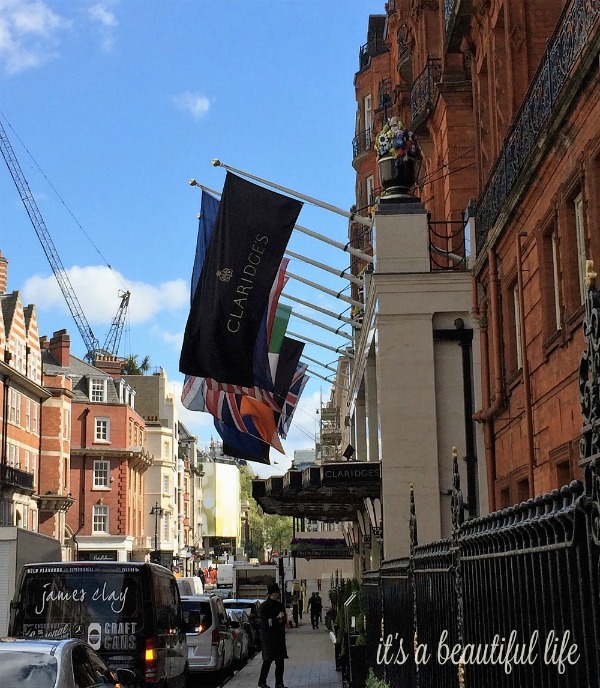 From there, we traveled up to London where we were booked for two days at the very nice (understatement) Claridge's Hotel. 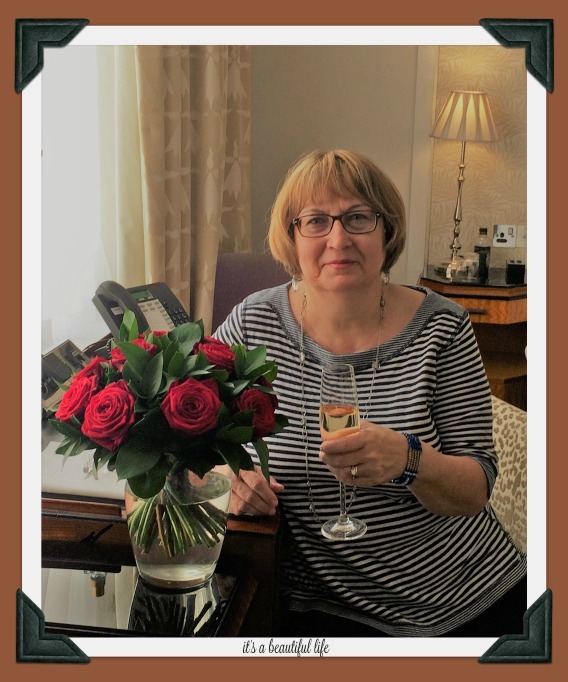 Rick had roses and champagne ordered ahead which arrived in our room shortly after we checked in. The lobby was spectacular. Every corner was polished. An elegantly attired elder gentleman invited us to step inside the opulent lift to whisk us up to our room, which was beautifully decorated and plush. I wished I had packed all my diamonds and a tiara (wink) when I saw what we'd stepped into. In spite of being tiara-less, we were treated royally. Did I mention that hubby did not tell me about this part of the trip ahead of time? It was all a big secret to be revealed once we arrived by London taxi at the impressive front entrance of Claridge's Hotel. First, we visited the amazing Victoria and Albert Museum, where Rick had searched out the Beatrix Potter exhibit for my great pleasure. We walked through some of galleries filled with art of some of my favourite painters. Such a thrill to see their work in person. We snooped in their delightful gift shop with all sorts of treasures to bring home. There was just so much to see -- a person really needed several days to see even just a few of the great exhibits. Back at our hotel, a doorman was at the ready to open the taxi door and help us out. We swept into the great lobby as if we'd always done it that way (just like in the movies). Soon we were enjoying Afternoon Tea and, in my view, it really was afternoon tea at its ultimate best. And I've had lots of elegant afternoon teas in my life. We had polite and friendly, not to mention handsome, young waiters to wait on us and pour our cups of tea. We could select different varieties of interesting teas to try with each 'course'. Photos on the walls indicated well-known people had visited this fine establishment over the decades, including Audrey Hepburn. I understand Cary Grant, Katherine Hepburn and The Queen Mother herself enjoyed taking afternoon tea there. And, apparently, Spencer Tracy once said he'd rather go to Claridge's than to heaven when he died. We understood, we felt quite spoiled amongst all this poshness and glamour, sitting on chairs where maybe someone more famous than I once sat to drink tea and eat cucumber sandwiches. Believe me, we soaked it all up, and loved every minute! I've included the link to a short video with some footage of the inside of Claridge's. It's from their website. You really do want to take a moment to watch it. Oh my goodness, it's a stunning peek into this beautiful and glamorous 5-star hotel. They gently advised not taking photos in the public areas to protect the privacy of all their guests. We felt a little sad about that, we're so used to in this day and age snapping pics at every turn. It reminded us that we were not at a tourist venue, but the real deal. So, thank goodness for memories. 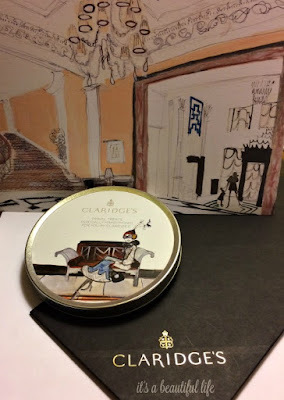 And now, just to prove we really were there, here are a few pics of our fairy tale stay at Claridge's in London. On that note, I'm off to get ready for our outing tonight. To my favourite Thai restaurant for dinner and then off to za opera. not to mention some proper Spring sightings in your part of the world. PS. 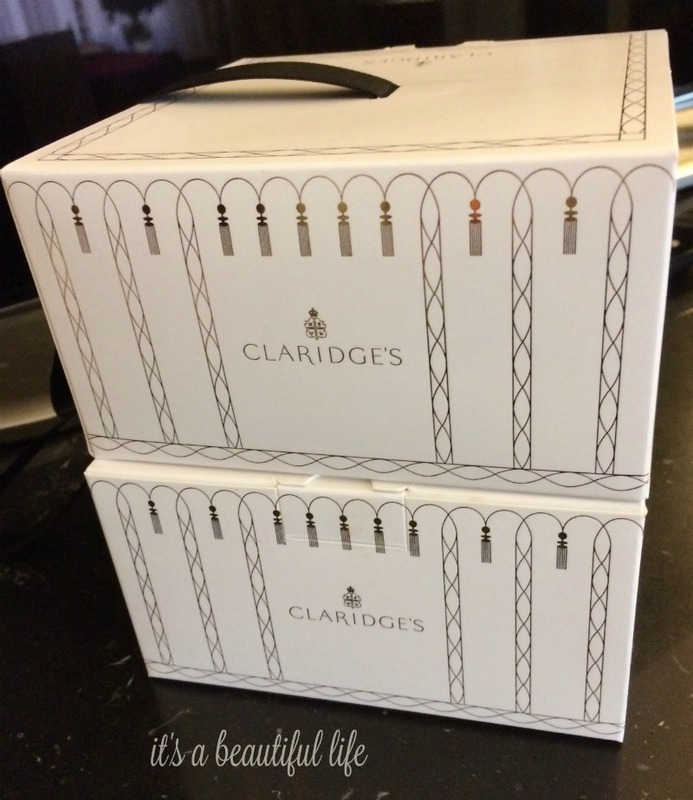 Aren't these take away boxes elegant? Just remembering it all again makes me feel happy! Brenda, what delightful treats...you deserved them all of course! 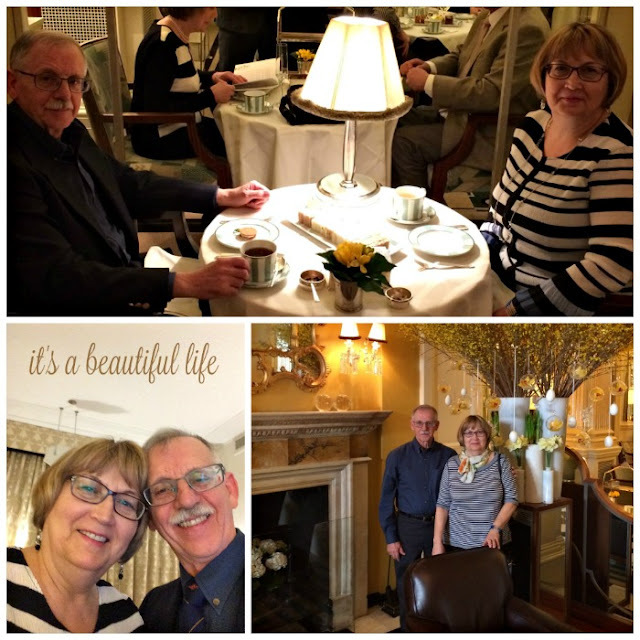 Many years ago my husband took me to the Ritz for afternoon tea, which was similar, and equally as lovely as yours. These are the precious memories for years later. Indeed, you are right: "The feeling of being loved never gets old." Such fun to hear of last year's birthday delights! 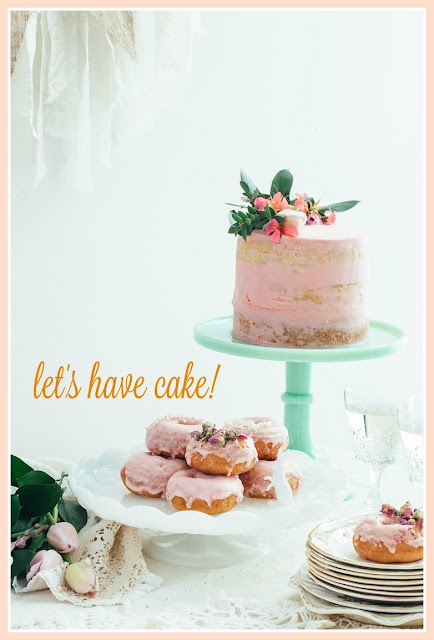 And now, a Happy Birthday to you as you experience new treats! May your new year be joy-filled! Thank you for not only remembering it, but sharing it; I am thrilled for today’s adventure. Happiest of Birthdays to you! Happy Birthday sweet lady! Every birthday should be this special! WOW! Enjoy your week...keep celebrating! Wonderful memories! Thank you for sharing them with us. Enjoy today's celebration! Happy Happy Birthday! Happy Birthday to you.Enjoy being pampered and fussed over. What a special birthday celebration! I hope you enjoy this birthday celebration, as well. Happiest of Birthday's to you, Brenda! 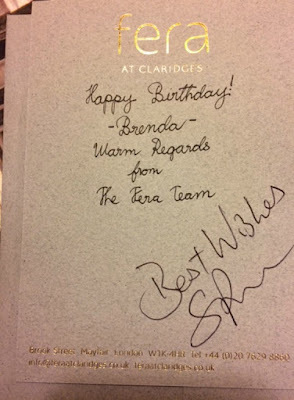 Dear Brenda - happy birthday a bit late. Hope the opera was fabulous. Thanks too for sharing some lovely memories of last year's birthday. What a way to celebrate. Hugs! Happy Birthday!! It sounds like you have a wonderful evening planned. Oh Brenda, how I have enjoyed your lovely birthday celebration from last year! Hope your day this year and special outing was perfect as well. Memories to treasure forever. Wishing you a wonderful year ahead! Belated Happy Birthday. I hope the year ahead runs over with 'feeling loved' moments! Happy Birthday, Brenda! 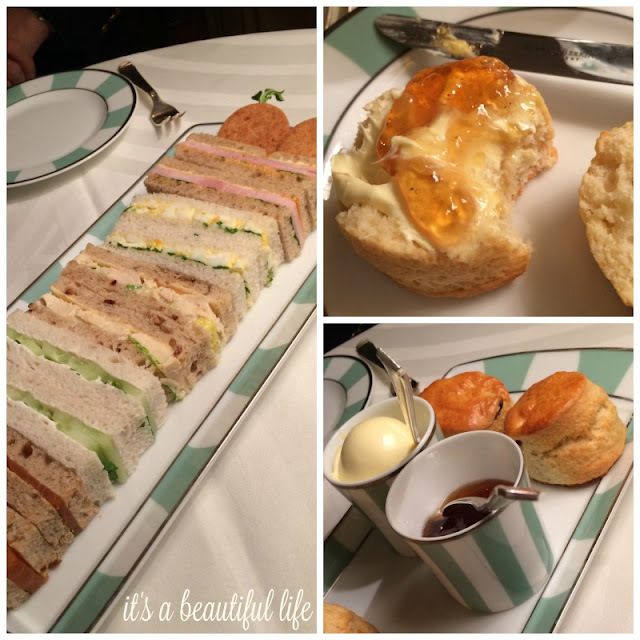 I'll have to add afternoon tea at Claridge's to my bucket list!